Painting a picture, which is usually done for pleasure, is an exhausting business. After 1 hour painting your judgement is impaired. This is part of the reason I like ‘1 hour paintings’. The job is complete and the following day you can review the painting and add a few touches which would have been difficult after the tedious initial painting. May Meadow needed something after its initial painting. Today (24 hours after) I added the touches I felt the painting needed. These were spots of pure colour, directly from the tube with Liquin only. Sap Green, a transparent rich green on some areas of the foreground to increase the perception of depth in the distance. Vermillion and Cadmium Yellow to represent wild flowers (Poppies and Dandelions) to counteract the green. As you can see these are just spots of colour, too much would have ruined the lush green nature of the painting. P.S. If you are painting at night, as I often do, be careful of moths. These little creatures, attracted to the lights, can cause a terrible mess if they decide to land on the surface of your painting. As you will see in the video of May Meadow (just after I completed the fence posts in the foreground), a particularly agile moth became entangled in the big tree. In the time it took me to make a cup of tea and fill my pipe it had created an enormous smudge. After I removed the culprit I was able to repair the damage. Had it been the distant details it would have been a different matter entirely. No matter how hard you try, you will never find a landscape which can be represented unaltered in a painting. This is, I think, because underlying every good landscape painting is an abstract design which we refer to as a composition. A photograph records the scene as it is, or so we think. The photographer is conscious of the fact he is trying to produce a picture which represents the real world. An example is the orange glow of a sunset. We expect an orange glow in the photo. If however, we take a photograph with the same settings, indoors under halogen light (standard bulb) this orange glow is not acceptable. In this situation our brains process out the orange and we think we are in white light unlike what we see in the photo. There are an infinite number of adjustments which can be made in the camera to adjust the ‘look of the photo’. When the photographer presents us with the final photo our eyes and brain process the 2 dimensional picture and imagine what the original scene was like. We don’t want an orange glow on our indoor photos, nor do we expect the abstract construction we find in a painting, we are looking at the real world. I take photographs for the sake of taking good photographs but I also take photographs as reference material for paintings. These photographs would not be considered good from a photographic point of view and several would be used to produce a painting. So it was with ‘May Meadow’. This painting is of the lush green of May. But nowhere was there a scene which had this and also a balanced composition, a journey for the viewer along a winding path, a sky we remember from our childhood, an expectation of something else at the end of our journey and much more. The painting was completed in 1 and a half hours and in a day or two I will introduce a little more colour, mostly reds, to counteract the green and heighten the intensity of the scene. I am preparing a video of the painting process which I will post in a few days. Art Materials – from where? When I decided to start this blog I decided only to make contributions which are of interest or value to anyone who bothers to read it. I will resist the urge to outpour details of the trivia of my life and times and keep the format simple and straightforward. This post, I think, will be of interest to Irish readers living in relatively remote areas, of which there are many in Ireland. Where I live there are no art supplies outlets. There are, of course, suppliers of craft products and stationery items but not the ‘artists’ grade or range of materials. I needed some paints and Liquin and would have to order ‘on line’. This normally means a UK based company which means an extended wait for the materials to arrive. I discovered ‘CorkArtSupplies’ an Irish based ‘on line supplier. I ordered 5x37ml tubes of Winsor & Newton paints, 500ml of Liquin and a small brush on Sunday night (after midnight, so actually Monday morning) and received the package today (Tuesday morning) by post. The prices were not significantly different from what I would have paid elsewhere and the range of materials is good. Check it out! 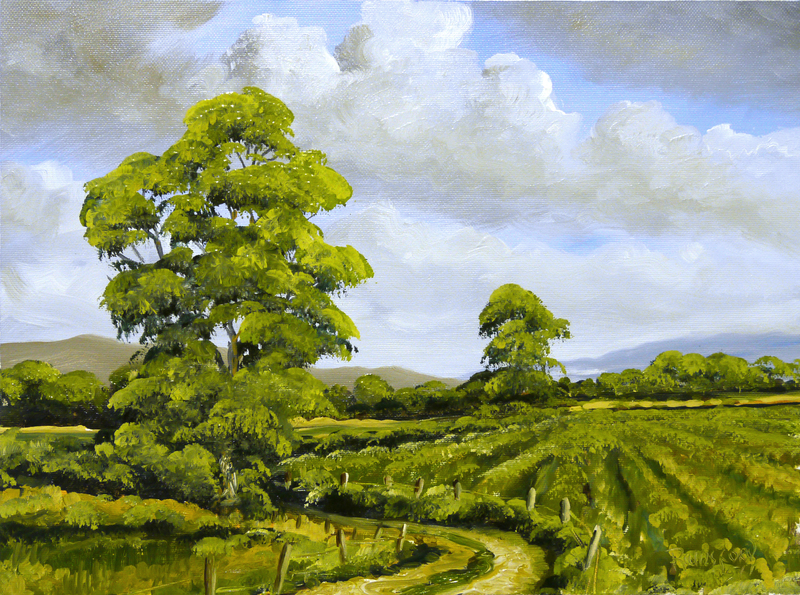 Summer is slowly arriving and I am looking forward to getting out and painting a few ‘bright, green landscapes’. I intend to video some of these painting sessions but will have to reduce the size of the paintings. A 1 hour painting compresses nicely into a 10 minute ‘time lapse’ YouTube video and is not too compressed. I personally enjoy watching these type of painting videos. Not too long to be boring and as they say ‘a picture is worth a 1000 words’, especially a moving picture. On left, an ‘on the spot’ sketch, a possible painting in the future. I thought I was finished, or almost, with this painting. But, there was something missing – the clutter and chaos of the undergrowth. Or to put it simply the painting was too idealistic, as you would recall the scene without the detail. There was as much time spent adding details with a small long bristled brush as I did painting the first stage. I didn’t video this part because, firstly I thought I would be only a few minutes adding a bit of texture to the trees and when I realised I was into something big I decided this work would not make a good instructional video. Tedious ‘needlepoint’ type of stuff that would put the casual painter ‘off’ for life. Even now, I don’t know if I am completely happy with progress to date. I’ll wait a day or two and see. Last post I was intending to add a ‘bit of texture’ by ‘scumbling’ – I didn’t. I added a ‘glaze’ which is a transparent film of paint over an already dry painted part of the picture. Traditionally, the process is to put a darker colour over a light one, which shines through the transparent layer. I did the opposite I put a transparent Chrome Green Light over the dark shadowed part of the tree trunks. Unusual effect, but gives a good ‘moss on trees’ look to the trunks. 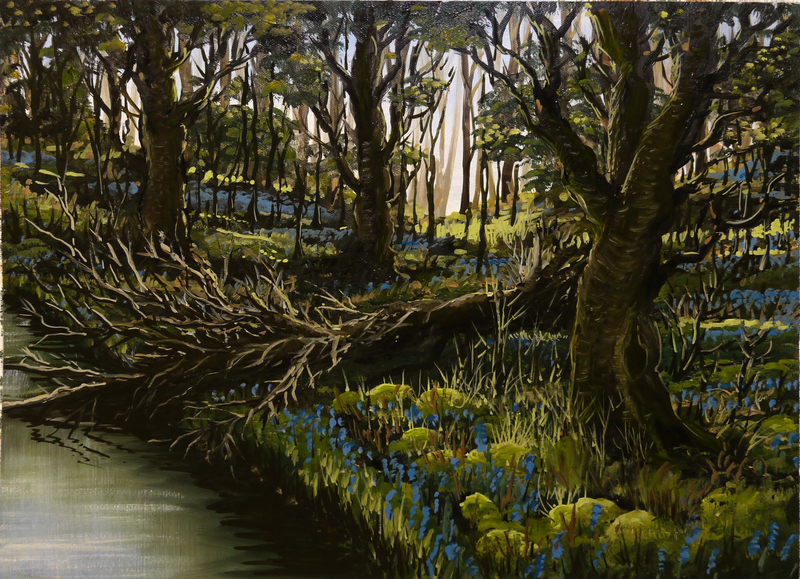 I will be busy over the next few days getting a few paintings ready for the Athy Art Group Exhibition in 2 weeks time. Last minute, as usual. After a tedious still life which took for ever to complete (last post) I was looking forward to a ‘quickie’. Compared to the still life this was relatively quick, about 2 hours with a bit to do when the pools of paint have dried a little. 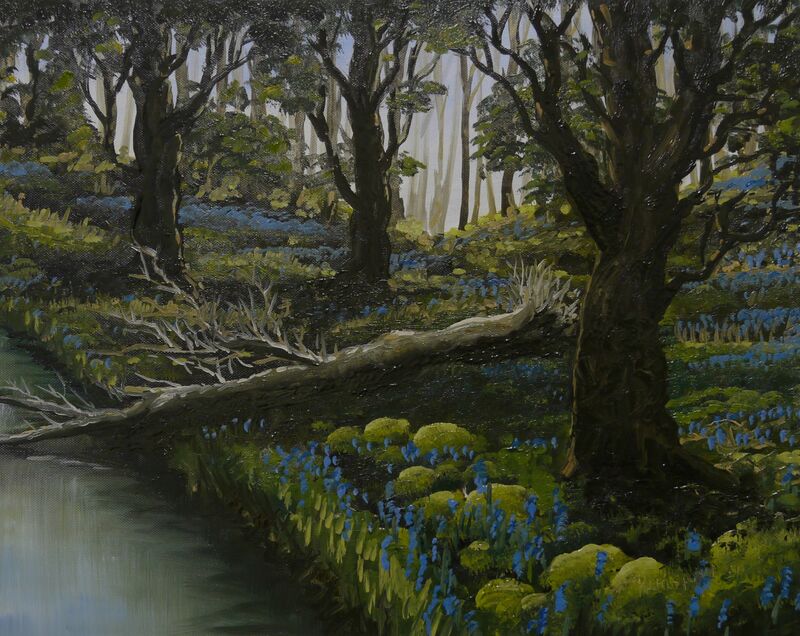 I would like to put a little texture on the trees and a shimmer on the water surface. Impossible to do on a wet painting. This involves dragging almost dry paint across the surfaces which sticks, here and there, on the paint surface. The media was mostly white spirits with ‘Liquin’ and a tiny amount of Linseed Oil so it will dry quickly and I can do the final touch up fairly soon. I videoed the process and will have the movie available soon. P.S. 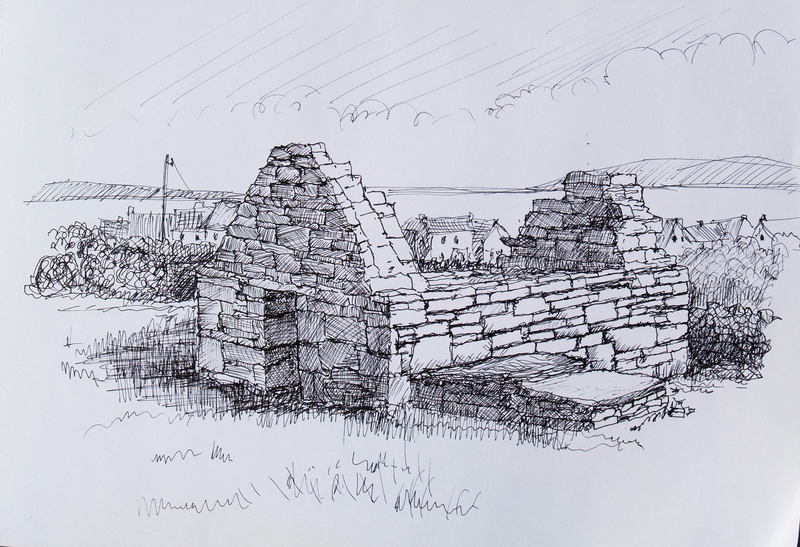 : The inspiration came from a visit to Kilranalagh, Co. Wicklow. The site of an ancient monastic enclosure, on top of a tree covered mountain, all that remains is a ‘Holy Well’, a few old walls and a graveyard. There were Bluebells everywhere, see Flickr photos. A door or a window were my original ideas for the right side of the painting but there was not enough space to have an architrave and the the door or window. There would not be enough of either to ‘explain’ what was there. An open window would have been a nice escape from the intensity of the detail in the items. The solution was to have a corner on the wall around which the viewer would explore the darkened corridor. The window effect was provided by a hanging a framed painting, the scene from a previous post – Cromaboo Bridge and White Castle. White Rose, White Castle, appropriate. The oblique angle was going to introduce a ‘wild’ effect to an otherwise calm, static composition. As mentioned in a previous post, the converging lines of the wall, picture frame and floor were worked out and charcoal lines placed on the painting. A mysterious light illuminates the hanging painting, wall and floor. Over the next few days the dull patches will appear especially on any painted parts which contained Ivory Black in the mix. I will apply a thin coat of Liquin which will create an uniform ‘sheen’ and fill any deep crevices in the brush strokes. 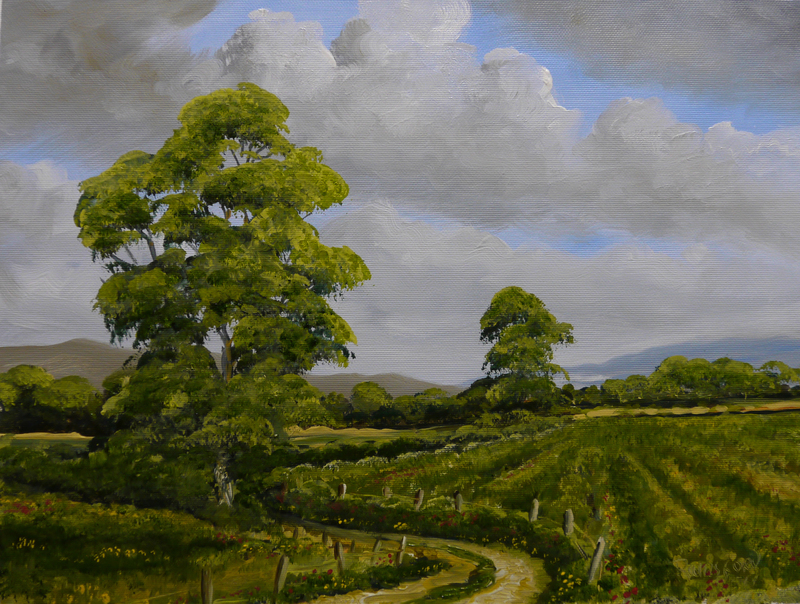 I will exhibit this painting, and others, in the Athy Art Group exhibition in June (will open on Tuesday 7th June) so there will be no time to apply a coat of final varnish. A very light coat of aerosol varnish will be applied just before framing. I will use glass in the frame with a gap of at least 20mm between painting and glass. I am now looking forward to painting a ‘fast’ picture as a break from the restrictive nature of this type of still life.